At least twenty pilots flew Kahana today as the wind gradually subsided. The conditions were best during the early session, with some pilots soaring high over Puu Piei, and some others flying high above Sacred Falls and points downrange. Cloudbase was unusually high, and we enjoyed a beautiful clear view of the Waianae Range as we soared the Sacred Falls plateau. I got to 3,400 feet ASL there before gliding downrange and landing just past Laie, only the second time I've managed to do that. It was great to see everyone out there! For those that arrived later in the day - it was dissapointing. Wasn't worth the time or the hike. If your time is so valuable, next time please save yourself the effort of typing a bitter anonymous comment. Out of all the friends who I saw yesterday, I'm struggling to think which of them might feel that their time and effort are so valuable that they would be moved to tag my happy little article with an unsigned complaint at 6:50 in the morning. Way to spoil my buzz, dude. I have to say, out of thousands of drives and hikes over all my years of flying, I've NEVER felt it wasn't worth it, especially when there were other people around to share the fun. I think that's how you know you really love this sport. 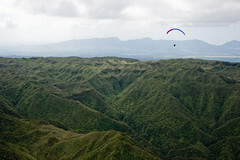 If you are looking for a sport where the conditions can be guaranteed, paragliding probably isn't for you. Anybody that gets more than an hour of airtime for every ten hours invested trying to get airtime should consider himself lucky - that's just the nature of the sport. Never take "Lucky" for granted! Thanks for the article and pictures Alex! Judging from the iwindsurf sensor readings and chatter posts, I was sad at work thinking no one was getting to take advantage of the clear range. I'm glad some of you did! I look forward to someday seeing those views again myself. To those who didn't make it up, you will some other day (if you keep trying). If golfers judged their time by making it in the hole on every shot, think how miserable (or perhaps more miserable) they'd be. Don't get disappointed, stay home!!! In paragliding, much like fishing, you're "working the odds" every time you go out there to fly (or fish). The more you get out there, the closer you are to that big fish or flight. While you're working your odds, you've got to enjoy the outdoors, friends, happy landings and other things these sports bring. It pushes you to keep trying for the big one! If it doesn't feel good just to be there, stay home and fly the net or remote control and avoid possible frustration. By the way, expectation leads to frustration. If you expect nothing more than a drive to the flying a site with the "possibility" of a flight, you will always get that and won't be frustrated, but if you go expecting an epic flight, your odds are against you (I am sorry)! I might get jealous by missing out the action but I get happy just to know a friend was there, made it happen and landed safely (and even happier when he/she shares the story and photos in this webpage we love) and I can only blame myself for no being there at the right place and the right time working my odds. A good example: a few weeks ago me, Alex and Jon hiked for 50 minutes / 1000ft asl expecting nothing but a sledder at Dilingham. Of course we want more than a sledder, but I'd be happy with just that. We hiked in no wind and landed as the kitesurfers where rigging their kites in nuking conditions. Lucky? a little bit, but that was my 3rd hike to that place and first epic flight. I worked my odds and it payed on the 3rd hike! I think my message is clear: if you're not willing to WORK your odds, just stay home and play chess or something. actually, not chess, since you could loose and that is a waste of time, right? Thanks Alex for the nice story, pictures and for make me jealous (again). I wish I could be there!